Weapon Stats & Strategy for Grenade Launcher in Fortnite. Read here to find information about the damage(DPS), rarity, and reviews for Grenade Launcher! 100 375 6 100 3sec. 105 394 6 105 2.8sec. 110 413 6 110 2.7sec. Check out the All Rocket Launcher stats List! Grenade Launchers are highly powerful in the right hands. Their high damage to buildings & explosive splash damage make it effective in all game modes. This weapon is effective in mid-range fights. Short fuse time of grenades render it ineffective in long distances. Using it in short-range combat can cause grenade bounce back & self-damage. The Grenade Launcher dishes out an insane amount of damage to enemy forts. They can topple structures with just a couple of shots. 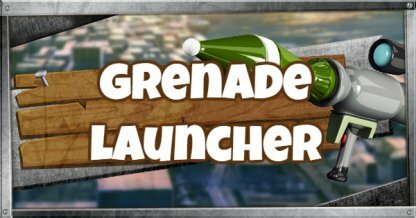 Grenades detonate in 3-4 seconds when shot from a Grenade Launcher. Take this in consideration when in the middle of combat. With this weapon, aiming can be hard. Knowledge & effective implementation of the weapon's grenade arc trajectory is needed to smartly use this weapon. Grenade Launchers can be found on the floor, treasure chests, and vending machines but come in Rare, Epic, & Legendary, making them rare to find in-game. Aim up and shoot above the roofs of enemy forts instead of its walls. Your grenades will land inside the fort to deal massive damage to walls and surrounding enemy players. Grenades launched travel in an arc trajectory. Keep this in mind and you'll avoid having grenades ricocheting and causing self-damage. Grenade Launchers work best in mid-range combat. It is not advisable to use this weapon when encountering enemies in close range due to possible splash damage & detonation time.